Aridoamerica denotes an ecological region spanning Mexico and the Southwest United States, defined by the presence of the culturally significant staple foodstuff Phaseolus acutifolius, a drought-resistant bean. Its dry, arid climate and geography stand in contrast to the verdant Mesoamerica of present-day central Mexico into Central America to the south and east, and the higher, milder "island" of Oasisamerica to the north. Aridoamerica overlaps with both. 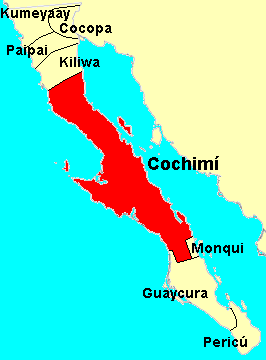 Because of the relatively hard conditions, the pre-Columbian people in this region developed distinct cultures and subsistence farming patterns. The region has only 120 mm (4.7 in) to 160 mm (6.3 in) of annual precipitation. The sparse rainfall feeds seasonal creeks and waterholes. The term was introduced by Gary Paul Nabhan in 1985, building on prior work by anthropologists A.L. Kroeber and Paul Kirchhoff to identify a "true cultural entity" for the desert region. The Chichimeca, an umbrella term for several tribes used by the Nahua people, were hunter-gatherers in Aridoamerica grasslands. They gathered magueys, yucca flowers, mesquite beans, chia seeds, and cacti, including the paddles of fruits of nopal cactus. The century plant (Agave americana) is a particularly important resource in the region. Despite dry conditions, Aridoamerica boasts the greatest diversity of wild and domesticated tepary beans (Phaseolus acutifolius) and is a possible site of their domestication. Maize cultivation reached Aridoamerica by about 2100 BCE. Archaeologists disagree whether the plant was introduced by Uto-Aztecan migrants from Mesoamerica or spread either northward or southward from other groups by cultural borrowing. In Baja California, fishing and hunting provided food, as did harvesting acorns, nopal, pine nuts, and other native plants. Historically, people of Aridoamerica coppiced willows, that is, tree trunks were cut to a stump to encourage the growth of slender shoots. These willow shoots were woven tightly to produce waterproof, cooking baskets. Fire-heated rocks were plunged into a gruel in the baskets to cook. ^ Nabhan, G.B. (October 1985). "Native crop diversity in Aridoamerica: Conservation of regional gene pools". Economic Botany. 39 (4): 387. doi:10.1007/bf02858746. Retrieved 3 July 2017. ^ a b c d e f g h Schmal, John P. "Indigenous Baja". History of Mexico. Houston Institute for Culture. Retrieved 16 November 2015. ^ a b c d e f g h i "Mexico: Map". Ethnologue. Retrieved 16 November 2015. Robery A. Bye; Edelmira Linares (2007). "9". In Carrasco, David. Cave, City, and Eagle's Nest: An Interpretive Journey through the Mapa de Cuauhtinchan No. 2. Albuquerque: University of New Mexico. pp. 255–280. ISBN 978-0-8263-4283-6. Retrieved 16 November 2015. Cordell, Linda S. and Don D. Fowler, eds. Southwest Archaeology in the Twentieth Century. Salt Lake City: University of Utah Press, 2005. ISBN 978-0-87480-825-4. Richard C. Pratt; Gary Paul Nabhan (1988). Gepts, Paul, ed. Genetic Resources of Phaseolus Beans: Their maintenance, domestication, evolution and utilization. Springer. p. 419. ISBN 978-94-009-2786-5. Retrieved 16 November 2015.